Chakrabarti, I., Ghosh, N. (2012). Radio-Cytopathological Diagnosis of Eosinophilic Granuloma of Skull in a 13-Year Old Boy. Iranian Journal of Pathology, 7(3), 203-206. Indranil Chakrabarti; Nilanjana Ghosh. "Radio-Cytopathological Diagnosis of Eosinophilic Granuloma of Skull in a 13-Year Old Boy". 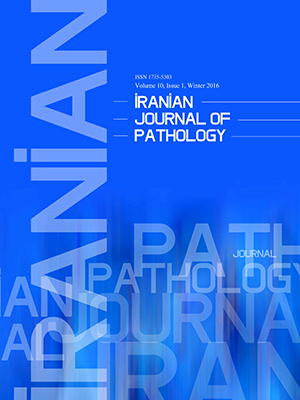 Iranian Journal of Pathology, 7, 3, 2012, 203-206. Chakrabarti, I., Ghosh, N. (2012). 'Radio-Cytopathological Diagnosis of Eosinophilic Granuloma of Skull in a 13-Year Old Boy', Iranian Journal of Pathology, 7(3), pp. 203-206. Chakrabarti, I., Ghosh, N. Radio-Cytopathological Diagnosis of Eosinophilic Granuloma of Skull in a 13-Year Old Boy. Iranian Journal of Pathology, 2012; 7(3): 203-206. Eosinophilic granuloma is benign end of the spectrum of the Langerhans cell histiocytosis (LCH) which is characterized by solitary or multiple lesions in bones, skin, lung, lymph node etc. Here, we present a case of a 13-year old boy with pain and swelling in the right parietal region of skull with no other complaint. A computerized tomography (CT) scan and subsequent fine needle aspiration cytology (FNAC) revealed solitary eosinophilic granuloma which was subsequently confirmed by histopathology. Minimally invasive procedures like imaging and FNAC usually suffice for diagnosing and following up of patients with this rare disease. Nicholson HS, Egeler RM, Nesbit ME. The epidemiology of Langerhans cell histiocytosis. Hematol Oncol Clin North Am 1998;12(2):379-84. Yoshida A, Tsuta K, Nitta H, Hatanaka Y, Asamura H, Sekine I, et al. Bright-field dual-color chromogenic in situ hybridization for diagnosing echinoderm microtubule-associated protein-like 4-anaplastic lymphoma kinase-positive lung adenocarcinomas. J Thorac Oncol 2011;6(10):1677-86. Yang JT, Chang CN, Lui TN, Ho YS. Eosinophilic granuloma of the skull--report of four cases. Changgeng Yi Xue Za Zhi 1993;16(4):257-62. Azouz EM, Saigal G, Rodriguez MM, Podda A. Langerhans' cell histiocytosis: pathology, imaging and treatment of skeletal involvement. Pediatr Radiol 2005;35(2):103-15. Haouimi AS, Al-Hawsawi ZM, Jameel AN. Unusual location of eosinophilic granuloma. Saudi Med J 2004;25(10):1489-91. Park SH, Park J, Hwang JH, Hwang SK, Hamm IS, Park YM. Eosinophilic granuloma of the skull: a retrospective analysis. Pediatr Neurosurg 2007;43(2):97-101. Jain k, Alam K, Maheshwari V, Jain v, Khan R. Solitary eosinophilic granuloma of the ulna: Diagnosis on fine needle aspiration cytology. J Cytol 2008;25(4):153-6. Kaul R, Gupta N, Gupta S, Gupta M. Eosinophilic granuloma of skull bone. J Cytol 2009;26(4):156-7. Atkinson B, Silverman J. Atlas of difficult diagnoses in cytopathology. Philadelphia: W.B. Saunders; 1998. Riegman PH, Morente MM, Betsou F, de BP, Geary P. Biobanking for better healthcare. Mol Oncol 2008;2(3):213-22. Jaffe E, Harris N, Stein H, Favara B. Pathology and genetics of tumors of haematopietic and lymphoid tissues. Lyon: IARC Press; 2001.